BACKGROUND: Hookah pipe smoking is a social practice and has gained popularity, especially among South African youth. The extent of this practice among health sciences students, and their knowledge regarding the health risks, are unknown. This is important, as these students will become future health professionals possibly influencing the practice of individuals and communities. OBJECTIVE: To explore the knowledge, attitudes and practices of hookah pipe smoking among students at the Faculty of Health Sciences, University of Cape Town. METHODS: A cross-sectional study was conducted among undergraduate and postgraduate students. A self-administered questionnaire was distributed as a hard copy and online survey. RESULTS: Of 228 participants, 66% had smoked a hookah pipe before, with 18% still smoking. Most began smoking in high school, with 25% initiating at university. Of the current smokers, 65% smoked occasionally socially, commonly at friends' houses for 30 - 60 min/session. A further 11% smoked cigarettes concurrently and 30% added other substances, mainly cannabis, to pipes. Most current hookah smokers had no interest in quitting (84%). Only 30% of participants had prior health information about hookah pipe smoking. Most knew that it was harmful (91%), with many not knowing why. A total of 80% of participants perceived that the practice was socially acceptable and 84% would recommend it to others. CONCLUSION: The poor knowledge about the dangers of hookah pipe smoking and the extent of its practice among health sciences students is alarming. These findings highlight the need for school and university health-promotion campaigns, and for better regulation of hookah pipe smoking. While the water filter and the fruity flavoured tobacco of hookah may make it seem innocuous, inhaled smoke contains toxic compounds such as nicotine, carbon monoxide, formaldehyde, polyaromatic hydrocarbons, arsenic and lead. [4,5] A hookah smoking session is usually longer in duration and involves exposure to much larger volumes of smoke. [6,7] Studies investigating the acute and long-term effects of hookah pipe smoking show that it is a risk factor for lung cancer, periodontal diseases, cardiovascular disease and adverse pregnancy outcomes. It also poses the risks of transmission of acute and chronic infections, such as tuberculosis and hepatitis, with sharing of the hookah pipe mouthpiece. [6,8] Thus, while hookah pipes are commonly perceived to be safer than cigarettes, they may be even be more harmful. Hookah pipe smoking is a highly social practice occurring on campus, in the family home, at parties, at a friend's place, or in restaurants. The influence of peers is a major factor in determining the initiation of using hookah. The South African Tobacco Control policy prohibits tobacco smoking in public spaces, but policies specifically prohibiting hookah pipe smoking in public spaces have not yet been implemented. Research shows that knowledge about the hazards of hookah pipe smoking tend to be limited in adolescents. [2,9,10] Easy social and retail access to both the hookah and its tobacco, combined with a lack of alternative activities,'111 contribute to the popularity of hookah. In South Africa (SA), the use of hookah pipes among students is highly prevalent. [9,11,12] This has been noted with concern by the Cancer Association of South Africa (CANSA), resulting in them approaching the School of Public Health and Family Medicine at the University of Cape Town (UCT) to conduct a study exploring the knowledge, attitudes and practices regarding hookah pipe smoking. The extent of this practice among health sciences students who will become future health professionals is unknown and they could impact on the practice of individuals and communities. To explore the knowledge, attitudes and practices with regards to hookah pipe smoking among students at the Faculty of Health Sciences, UCT. A cross-sectional study was conducted in March 2013 among the 3 582 undergraduate and postgraduate students registered in 2013. The minimum sample size was calculated to be 256 based on a 40% smoking prevalence estimate for the Western Cape and a precision of 6%. A self-administered questionnaire was adapted from a previous hookah pipe study conducted in the Western Cape. Data were collected via two methods: distribution of hard-copy questionnaires on campus, and an online survey. Hard copies were more likely to be completed by undergraduates who make the most use of campus areas, while the online questionnaire served to reach senior undergraduate students and postgraduates. Informed consent was obtained prior to participation in the study. The study was approved by the UCT Human Research Ethics Committee. A total of 228 students completed the questionnaire; 111 in hard copy and 117 online. The majority of participants were female (64%). The mean age of participants was 21.4 years (standard deviation ±4.38). Over half were undergraduate medical students (54%); 29% health and rehabilitation sciences and 9% postgraduate health sciences students. A further 8% were taking subjects in the faculty towards degrees registered in other faculties. Two-thirds of respondents had smoked a hookah pipe before, even if only once or twice, while 18% are currently smoking. Of the current smokers (n=41), the majority smoked occasionally socially (65%). The most common place for smoking hookah was at friends' houses (41%), at home (30%), or in clubs and cafés (21%). A small number smoked on campus (8%). Most participants smoked with friends (59%), while some smoked with family (20%). Most participants (61%) smoked between 30 - 60 min/session. Almost a third of participants (29%) supplemented hookah products with other substances, most often cannabis (86%), with a small number adding alcohol. Methamphetamine ('tik') and other drugs were not added. A minority of those who currently smoke hookah pipe smoked cigarettes too (11%), most daily (60%). A minority of students (27%) reported adverse health effects (e.g. cough, shortness of breath, loss of taste and headaches) that they attributed to hookah pipe smoking. Most current smokers did not wish to quit (84%). Most participants began smoking in high school (67%), while a quarter (26%) began in university. The majority of participants began smoking hookah pipes because they 'just decided to' (67%), while a smaller number were recommended to do so by someone else (19%). For most smokers (55%), parents or partners knew that they were hookah pipe smokers and most (76%) were accepting of the practice. Only 31% of participants had prior information regarding the dangers of hookah pipe smoking, with 60% obtaining knowledge from printed and audiovisual media. Knowledge of the health effects of hookah pipe smoking, drawn from answers to six questions that referred to these health effects, was categorised as good (29% of respondents), average (55%) and poor (16%). Almost all participants (91%) knew that smoking hookah pipes was harmful. 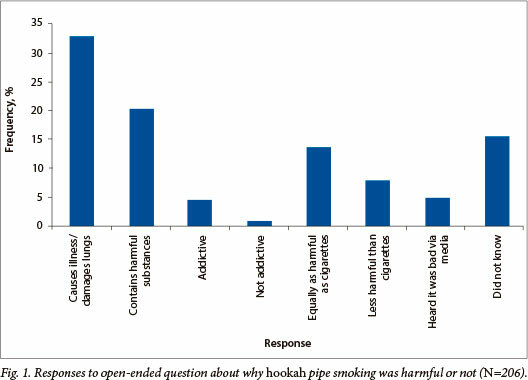 Responses to an open-ended question about why they thought hookah pipe smoking was harmful or not are shown in Fig. 1. The majority had a permissive attitude towards hookah pipe smoking, with 80% believed it to be socially acceptable, and 84% were willing to recommend it to others. Contrary to this, the majority of individuals (74%) believed the practice should be subject to legal regulation. While it was encouraging that most of the sampled students were not currently hookah pipe smokers, the majority had tried it at least once, suggesting an ease of accessibility and acceptability of the practice. Of those smoking, a third smoked on a regular basis, in contrast to other SA research indicating that the majority of hookah pipe smokers smoke daily. The social element of hookah smoking is significant, and peer pressure is a major factor in initiating usage, and the majority of participants started smoking in high school and university, with peers. It is concerning that hookah pipe smoking is permissible in families, as there are high levels of acceptance and practice among family members. Hookah bars, cafés and restaurants are social places for hookah smoking. However, selection of smokers' or friends' homes were more common among the sample. In contrast to the findings of a study done at another local university where a large proportion of students smoked hookah on campus, few students smoked on campus in our survey. This may be attributable to the strict policies on any tobacco products on UCT campus. Although the number of concurrent cigarette users may be higher than that of exclusive users of hookah, we found that only 11% smoked cigarettes and hookah concurrently. Nearly a third of hookah smokers in the current sample supplemented their hookah products with cannabis, which suggests that this practice could provide an opportunity for the use of narcotics, thus increasing associated risks. Most students had only an average level of knowledge of the risks associated with hookah pipe smoking, indicating a need for education on the topic. Important to consider, is that a large number of participants had not received any health information about hookah pipe smoking previously. While most could identify that hookah pipe smoking was harmful, many gave incorrect reasons, indicating a knowledge gap. Some perceived hookah pipe smoking to be less harmful than cigarette smoking, suggesting that hookah is perceived as a safer alternative. However, previous studies have suggested that hookah pipe and cigarette smoking share similar health risks, with more carbon monoxide, similar nicotine and more smoke exposure during a session of hookah pipe smoking. [6,7] It is concerning that the health effects of hookah pipe smoking are unclear. Most students had permissive attitudes towards hookah pipe smoking, believing it to be socially acceptable and that they could easily access hookah pipe products. However, not as many would recommend it to others and the majority believed that the practice should be subject to stricter regulation. Currently, while the South African Tobacco Control policy prohibits tobacco smoking in public spaces, such prohibition does not explicitly extend to hookah pipe smoking. Limitations of the current study include possible response and recall bias in questionnaire responses, as well as selection bias. Hard copies were distributed to students in the social areas of the campus, which may influence the composition of the sample despite an online questionnaire being available to all health sciences students to counteract this effect. The current study neither explored reasons why those who no longer smoked hookah pipe had stopped, nor the temporality of cigarette smoking on hookah pipe smoking. This would have been useful in the interpretation of attitudes towards the practice. The current study was conducted among a subset of SA's future health professionals. Their poor knowledge about the dangers of hookah pipe smoking, coupled with the extent of its practice is alarming. Permissive attitudes toward the practice, the young age of first experimentation in high school and at university, together with low exposure to information about hookah smoking highlights the need for school and university health-promotion campaigns, as well as for the better regulation of hookah pipe smoking and awareness campaigns at a national level. Acknowledgements. The authors thank CANSA and the Faculty of Health Sciences, UCT, for support throughout this research, as well as the students who participated in the research.